Terengganu (formerly spelled Trengganu or Tringganu) is a sultanate and constitutive state of federal Malaysia. The state is also known by its Arabic honorific, Darul Iman ("Abode of Faith"). The coastal city of Kuala Terengganu which stands at the mouth of the broad Terengganu River is both the state and royal capital as well as the largest city in Terengganu. Its located in the east coast of Malaysia. Terengganu is famous for its beautiful islands and white sandy beaches. The place where tourists go snorkelling and scuba diving to be amongst the wonderful sea livings. My last week post was about one of Terengganu's signature dishes; Nasi Dagang. And this week , I am putting up the fish curry that pair up well with the rice. Lengthy preparation and cooking time, but its worth it. Leftover sauce/ gravy freezes well too . Place tuna cutlets in a sizeable saucepan or wok. Pour water just about covering the cutlets. Add in tamarind slices, palm sugar and salt. Bring to boil for 5 minutes then turn off heat. Blend coriander seeds, fennel, galangal, tumeric, garlic, ginger, onion and red chillies. Heat up coconut milk in a thick base saucepan (or big wok) until oil separates. Add the blended spices, roasted coconut (kerisik), palm sugar and cinnamon stick. Bring to a quick boil then simmer until the sauce has reduced to half. Add fish and fish stock. Simmer on low fire until the sauce thickened. Scrumptious! I love tuna and those flavors. Love fresh tuna! 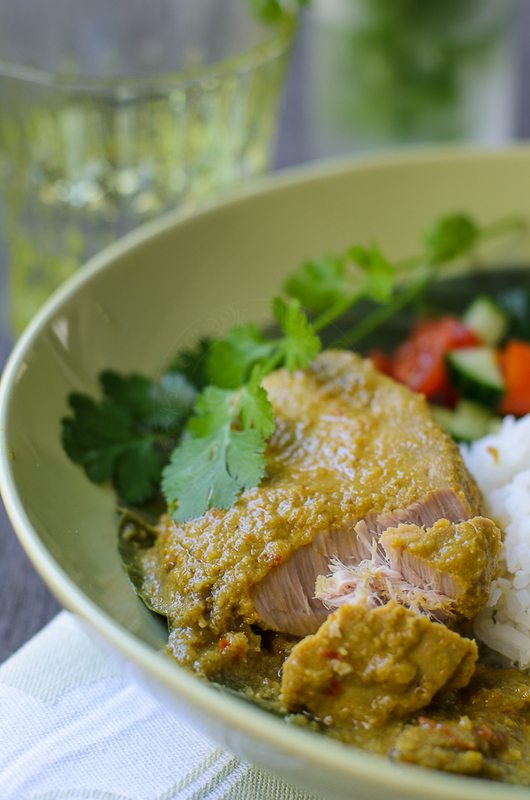 Your tuna curry looks so delicious! glad to follow you here...you have a luvly space.....this fish curry is so yumm! That's the kind of dish that I'd love to prepare ! Thank you so much for the recipe! I almost never use fresh tuna, but enjoy it so much every time I do. This looks lovely.